Company: A Step Up Career Academy Center, Inc.
La Shaunessye Williams is the Executive Director and Co-Owner of A Step Up Career Academy Center, Inc., a preschool that provides children with a first-class early education, and focuses on children between the ages of 6 weeks and 12 years old. Ms. Williams specializes in curriculum development, and in her role as head of the early childhood development center, she sets the foundation for developmental learning, including personal, social, emotional, creative, aesthetic and physical development. She also organizes educational and developmental programs for 75 children. 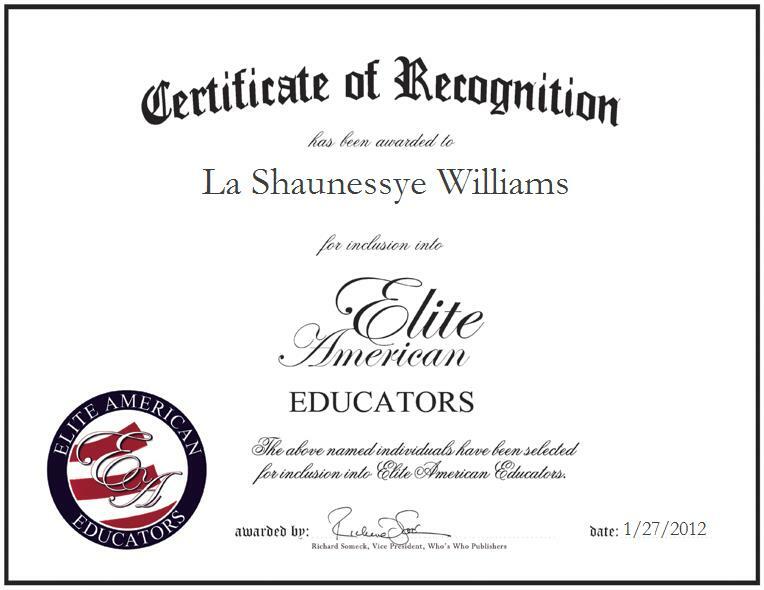 Ever passionate about a career that allows her to help children to flourish as future leaders and continuing learners, Ms. Williams shines as a mentor to those around her; in 2007, she placed second in a Christmas decorating contest which brought out the creative and artistic power of the children she taught. Ms. Williams would like to be remembered by her peers as an educator who cares for children’s safety, education and health.